This is Scott and Andrew’s second year reading together. Scott Passik, an AVP in the Money Transfer Department at MUFG, is in his third year volunteering with Read Ahead. He started reading with Andrew, a student at P.S. 37 in Jersey City, in 2013. Scott has provided the one-on-one attention and support that has helped Andrew become a more confident reader—particularly of dinosaur books! I’ve had some experiences in the past where I’ve really needed to lean on my support network and I was so grateful that the support network was there. As a big fan of Oprah Winfrey, I believe in concept of paying it forward. My employer, MUFG Union Bank, NA, is involved with a lot of volunteer programs, so when I saw Read Ahead and saw that it was just an hour a week time commitment, I was immediately interested. I wasn’t sure exactly what I was getting myself into, but the students have been really cool and it was just so much fun to go to the school every week and spend one-on-one time with a student. What has it been like to work with Andrew, your current student? I’m really glad that I’m getting to read with Andrew for a second year, since we got to skip the getting-to-know-you phase this year. And I’m starting to read some of his body language. He’s a very nice, very polite young man, but sometimes I can see, if we’re reading something that might be a little much for him, he’ll start to retreat a little bit. He’s very interested in dinosaurs, so we’re constantly reading these books with multisyllabic dinosaur names, and if it’s a little too difficult and I see him start to retreat, I’ll suggest that we find a different book, or we’ll take a break and do something else. If he’s shying away from something or isn’t having a great day, I try not to push it. Sometimes I can see that he just wants to talk and so we’ll talk, about our families or our pets. You’ll find that sometimes all they’re looking for is someone’s ear for an hour. I really think that we’ve developed a friendship. I also think my success in the program has a lot to do with Beryl, the Program Coordinator at P.S. 37. She’s excellent at picking books and really takes control of the room, which isn’t an easy thing to do with a bunch of ten-year-olds. Have you noticed any changes in him over the past year and a half? He’s definitely becoming a little more confident. There are still times when, if it’s his turn to read, he’ll get a little uncomfortable and quiet, but he just needs a little encouragement. Every now and then he’ll come across a word he doesn’t know and he’ll sound it out—I make sure to tell him that he’s doing really well. You worked with a different student during your first year in the program. What have you learned from working with two different students? The first student I worked with was a little more outgoing, so my process changed a bit when I started working with Andrew, who is a little more shy. I took a lesson from my own life—my two kids are polar opposites, so one of the lessons I learned early on in parenting is that you can’t parent two kids the same way. I brought that lesson with me to Read Ahead. 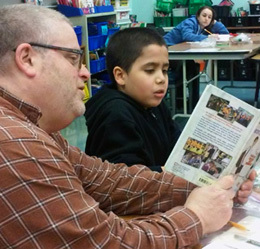 What has been the most rewarding part about volunteering with Read Ahead? These kids are our future and it’s so easy for them to get lost in a big classroom. One-on-one time is so important. Sometimes kids won’t take a chance on being wrong publicly—but when I’m reading with Andrew, if he messes up a word, it’s just he and I that know it. So he’s willing to open up a little bit and take a shot.